The V1.8 “POSEIDON” Patch out Now! While we are very busy with our next big strategy game, we still managed to find time for some Age of Wonders 3 spring cleaning. In addition to killing bugs and adding a bit of twinkling polish, we have added new water gameplay features for you to enjoy. Thanks to all you folks trying out the public beta for 1.8; we fixed one additional rare crash when moving an army over an ally’s structure in the same turn that you declared war on them. Grab V1.8 it now on Steam and GoG! The new buildable water fort and water resource in action. Added new Build a Water Fortress ability. 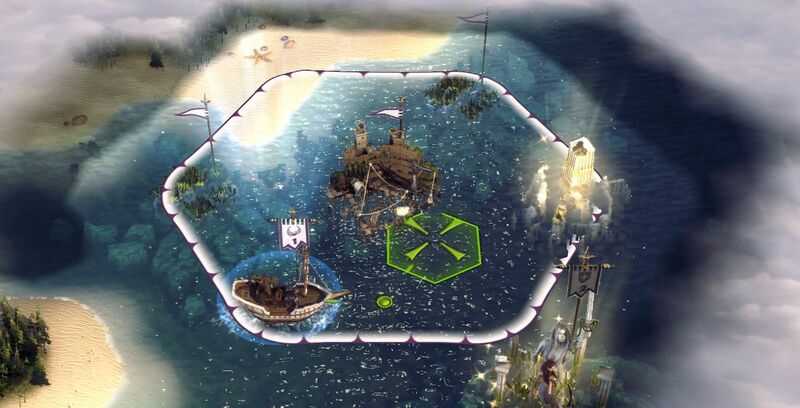 This enables embarked Builder Units to create Fortresses on water and claim water structures more easily. Added new Oyster Reef structure. Oyster Reef generate gold and population within your domain. Fixed 2 issues where units could sometimes shoot through walls and other obstacles without a line of sight penalty. So your dudes and dudettes are safe behind their walls now. Fixed an issue where entering combat would wipe extra move points gained from Death March. Allowing you to use Victory Rush to the fullest. Mind controlled/ghouled units now always have 0 move points on the world map after battle. This is intended as nerf strategies based on unit acquisition in combat. Mind controlled units can no longer retreat from battle. No more cheap summon stealing, sorry. Chaos Rift, Great Immolation and Great Stoning now warn the AI that it needs to abandon siege defense during tactical combat. Charge!!! If a summoned unit evolves, then the summoning spell will be cancelled, and the unit will become a normal unit with a higher mana upkeep. The mana cost is based on the typical cost to summon a unit of the unit’s new tier. Fixed a bug in the random map generator when generating a map with teams enabled. Teams would always be generated counter-clockwise around the map, making it possible to predict the location of other teams. Fixed a crash when clicking the ‘center’ button in the ‘structure captured’ popup after the structure was razed. Fixed a crash that would sometimes occur when releasing a city or a dwelling as a vassal. Fixed a bug where items being couriered would remain stuck in the hero inventory when an AI hero joins by surrendering. Fixed a bug where AI attacked vassal city of friendly player. Human Crusader now has the right impact sound. Fixed a crash when moving an army over an ally’s structure in the same turn that you declared war on them. Fixed PBEM exploits. More information after official release, for obvious reasons. Fixed hang in PBEM when one human player remained. Now you can end the remaining AIs rightly. Fixed PBEM notifaction issue for other players turn. Fixed PBEM issue where player was not properly notified of defeat. This prevents a dead state that has you staring at clouds. Fixed PBEM issue when swapping slots in setup. So the host can now safely take slot 2. Fixed PBEM issue when PBEM settings where changed before the session was launched. This could prevent a game from being launched, etc. Fixed a crash when starting a map for which the first map layer was removed in the Level Editor. Fixed popups being removed when they shouldn’t be. Should help when reading damage popups for spells in combat. Changed the ‘Reaper Scythe’ AoW Item Visualization link from a spear to the ‘Necro_Scythe’ model. Fixed the Imperial Hand Cannon visualization in Tactical combat. Assassin’s Stiletto of Silent Murder now has correct weapon displayed. Removed the obsolete ‘Vanquish Evil Player’ and ‘Vanquish Good Player’ entries in the Tome of Wonders under alignment modifiers. Linked text to fix empty table entries in the ToW under relation modifiers. Fixed an incomplete description for the goblin military level 5 race governance skill. It now also states that the relevant unit types get +5 hitpoint. Fixed an issue where terrain penalties would still be listed, even through they were disabled by the Bolster spell. This topic contains 92 replies, has 41 voices, and was last updated by rilian-la-te 1 year, 7 months ago. Call Lightning does the trick as well. It can be a hero ability as well and doesn’t need mana, and it’s not a once-per-battle ability. Amazing. Great to see AoW III isn’t forgotten. I am amazed, truly amazed by your commitment to continue to support AoW III even after more than three years since its release! Oh, and they have added new features too! Thanks for taking the extra time to improve our beloved game even more! You guys really rock, but you already know that, don’t you:-). Thanks for the continued commitment and taking in ideas and suggestions from your players. So 1.9 will be “HADES” Patch and 2.0 “Typhoon”? Tested the new water gameplay. Really like what you did here. I like to adress that I really appreciate the effort; the icons for the Oyster Reef and Water Fort and the tactical combat map of the Water Fort are all brand new and look great. So far no problems, the game runs as stable as I’m used to. Excellent news. Looking forward to the gog.com patch eventually…soon? Great stuff guys! Nice addition for the water fort. Looking forward to the PBEM exploit changes. Just one pet peeve of mine still remains and that’s the instant razing of forts. Suggestions were done earlier to make it just one turn to raze a fort. It will really help out in multiplayer and PBEM I think. And awesome everything is going smoothly for you. Patches will be made available on Steam and GoG more or less simultaneously when the patch is official. No Beta on GoG unfortunately. Hey Sikbok, have you looked into the Galaxy client as an option for providing beta patching through GoG? This reply was modified 2 years ago by Hulahn. Since the oyster reef will add population, it might be worth updating the Necromancer’s “Corrupt Source” spell to allow for corrupted coral reefs that can generate undead population instead (similar to corrupted farms and corrupted springs). Great update with many small but significant changes that we had been discussing for many months among the PBEM community and for which we thank the devs for listening to us! I want this too, if only to see what an undead oyster looks like. That being said, when are we going to learn something substantive about this new game you guys are working on? It’s been about two years since we first heard about it, and we still don’t know anything more than “it will be something that will very much appeal to the typical AoW player”. I haven’t been active on these forums since about January ’16 (I think), but I pop in about once a month to see if there’s any news. If I’ve been checking the wrong site, someone let me know, because I feel like we should have heard SOMETHING by now, and I’m still 100% in the dark. No, the project is still super secret. So you’ll have to be patient for a bit longer. Can we get an estimate on how long our patience has to endure, then? When the new project was first announced, I thought we’d be hearing something within a couple of months, not years. If someone had said it would be this long back then, I wouldn’t have found that so disheartening. So, should I check back later this year, or should I not bother until 2018? All I’m saying is, if you can’t give us details yet, can you at least tell me at what point I should start poking around this forum again for updates? This reply was modified 2 years ago by Jaduggar. In all fairness, Jaduggar has a very valid point. We’re not asking for specific details you can’t divulge, but at least give us some sort of time frame. Should we expect details this summer? 2018 summer? This reply was modified 2 years ago by Yigg. It’s excellent to see our Devs still providing attention to this great game even now, years after development, as others have already said. Anyway, to be fair, many games take years of development, especially if they are developing or utilizing a new/custom engine for it(?). As I remember the Devs stating that to do some of the stuff they had really wanted to do to improve the game, would have required a new/different game engine. Of course, without knowing the exact type of game they are developing, the above may not be entirely relevant, and perhaps it’s simply developing a different type of game than they have previously, that is increasing the development time. This isn’t a large development team, after all. Heck, at least one person is apparently even still giving development attention to AoW3. As far as I figure, they are still in Alpha, or even Pre-Alpha with the new game right now, and that’s at least one main reason that they haven’t opted to release specific information on it. They may also have some sort of investor/sponsor-related NDA that they have to follow themselves, or something. That’s a thing, right? I think their silence is mostly to not cause an uproar if there’s a change of plans. From what I understand, it sounds a lot like pre-alpha stage is the current one. I actually poked them a bit, and I got a reference to this. Anyway, I think part of it is the early stage of the game (although my rumour sources say they have a playable prototype) but I think a big deal of it is managing expectations. Better to say “there’s something,” and then when, inevitably, several things don’t work or there’s a direction change, they can manage things better. for example, there was a very early video of AoW3 with Lennart playing where the victory/loss condition was still like AoW1, i.e. lose you leader and you’re toast, and Lennart lost his leader. Except that we know NOTHING about the game. Not even what KIND of game it is. FTP Arena game, Space game, Fantasy game, AOW 4 … NOTHING.